Black Manta swims up to Luthor's Kryptonite fortress island and sits in on a meeting of the Legion of Doom. While on New Krypton Superman and Brainiac do battle, as Brainiac gets away with young Prym-El. Brainiac joins the Legion of Doom, when they are called out by Aquaman and the Justice League. The two teams battle it out, when Starro arrives and takes down the League. Superman arrives and defeats Starro, loosening his grip on the captured Justice League. Just then Prym-El busts out of Brainiac's ship and declares that he is now called Superman Pryme, and Brainiac attempts to send Lara back to the Phantom Zone. Story - 5: I really feel that Art Baltazar and Franco should get the opportunity to write one of the regular books one day. They have a good grasp of the DCU characters and also complex storytelling. There are so many subplots in this book, it's hard to imagine it's aimed at young children. I was surprised that Starro of all characters showed up, and then I was surprised at myself for being surprised... I know it sounds weird to read that, but I always forget just how many cool characters there are in the DCU that Art Baltazar and Franco can use at any time. I love that it was Superman that defeats Starro, it was just a great Superman moment, one that you always expect in a Justice League type story. Excited to see what happens with Superman Pryme next issue. Also love that he is wearing the iconic Superman suit. Art - 5: I love the art in this series. Being a graphic designer and illustrator myself, I appreciate the simple-ness of it, and how strongly it can convey the story. It's almost like reading a superhero comic done by the great Matt Groening. In fact I'd love if they would make an animated series aimed at young children in this art style. I've said it before, the art reminds me of old school Hanna Barbera animation! The highlights for me though were Green Lantern Ch'p and Black Manta. 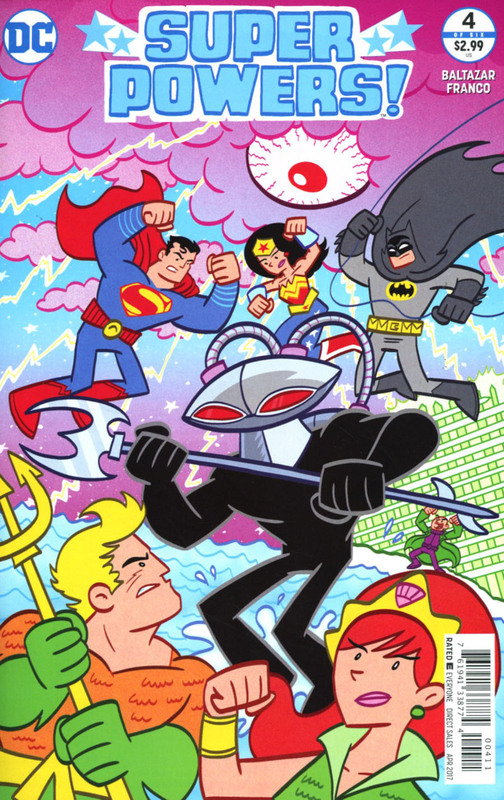 Cover Art - 5: I love this cover, mainly because I love Black Manta as a character. Also I love the hidden detail in the sky that is obviously Starro.